So, you’ve been building your email list. Now what? Many artists struggle with what email to send their fans and end up falling behind the eight ball. In this episode of The New Music Industry Podcast, I share 10 types of emails you could be sending to your fans. Thanks for joining me. 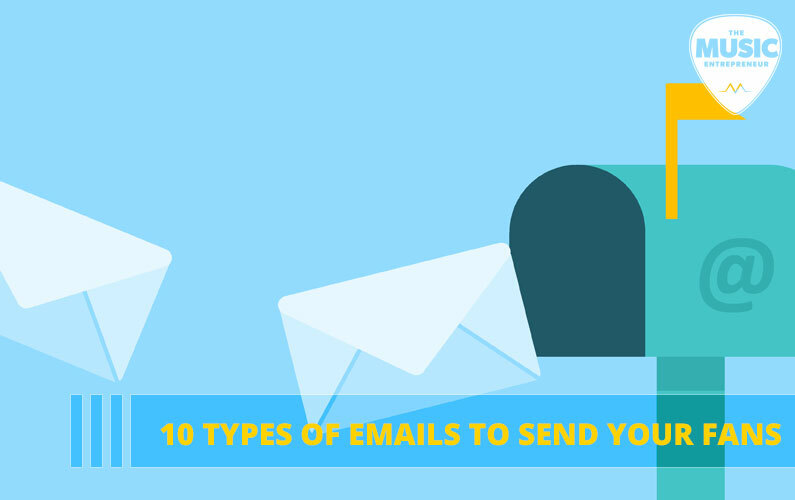 Today I wanted to look at 10 types of emails to send to your fans. Perhaps you’ve started building your email list, which is all well and good, but a lot of artists struggle with what to send their fans. Even if you have been building your email list for a while, you might be in the same predicament. So, I’ve come up with a few different ideas you can use, which should help you engage your fans more consistently. That way, your fans aren’t wondering why you’re suddenly emailing them out of the blue when you haven’t even talked to them in the last three or four months. The first type of email to send your fans is promotional. I know this is obvious. I know most artists are already doing this, but it is an important category. If you have an upcoming tour, a new release, an album, an EP, or a single, new merch items that your fans can purchase, or even if you’re launching a crowdfunding campaign, you should be letting your fans know about these things so that they can purchase your latest release or help support your crowdfunding campaign. Number two is news updates, which sound similar to promotional posts, but these are more so just letting your fans know what’s happening. So, what are you doing on tour? When is your new release coming out? Maybe you’re making a last-minute appearance on stage on Thursday and you want to let your fans know about that. Or maybe you’re doing a TV interview. Or perhaps you just got signed to a label. If there is anything new happening in your career, your most loyal fans are obviously going to want to know about it, so you can kind of mix up your promotional and news update type emails to keep things interesting. The third type of email you can send to your fans is blog posts. If you are a blogging musician, you may already have a bunch of content in your archives that you could be sharing with your fans occasionally. Now, you don’t need to include the full text of the post necessarily in the email itself. What you can do instead is maybe add the first or second paragraphs and then add a “click here to read more” button at the end of it. Number four is videos, so really any video you’ve already published to YouTube, whether it’s a lyric video, concert video or music video. This is something your fans would appreciate finding in their email. Simply create a video thumbnail with a play button. You can link that image over to YouTube so when your fans click on it within the email, they are immediately brought over to the video on YouTube. Number five is tour diaries. This is something you may already be doing with your blog, but if you’re not a blogging musician, then this is an excellent place to share your latest happenings. You could for example send a weekly update just talking about all the crazy things that have been happening on tour. If you are touring, then rest assured you’ll have lots to talk about. Number six is press. Every time you’re mentioned in a blog post or an article or a review, you should be sharing that with your fans. This just gives them a sense that you’re out there doing things. It lends more credibility to your name. Feel free to share negative reviews with your fans too. Just beware of slamming people for writing negative reviews about you. Instead, let your fans go and react in whatever ways that they see appropriate. Again, don’t tell your fans to slam them either. Number seven is contests and giveaways. This gives you a really great excuse to email your fans at least on a monthly basis. If you aren’t already giving away a CD or a merch item every month, that’s a really good place to start. Just let your fans participate in these contests and giveaways. It’s not a bad way to grow your email list as well. Number eight is reviews. This takes a little bit more work, but you can review music venues, your favorite restaurants, your favorite albums, or even recent gear purchases. This type of email may not help you get any more streams or any more sales, but it is a good way to engage and connect with your fans. You don’t necessarily need to write really long reviews either. That way, you can keep your emails short so you that people can easily digest them. Number nine is interviews. This is a category perhaps you aren’t really thinking about, but you could be doing quick interviews with interesting people you meet at your shows or even on the road. You don’t even need to ask more than three or four questions, but by interviewing interesting people, you can give your fans an inside view into things that you are doing as well as the music industry. In a way, you’ll become an influencer or a tastemaker in your own right. Number ten is surveys. Why not make some fun surveys for your fans using a tool like SurveyMonkey and occasionally send out some weird and interesting and intriguing questions that your fans can answer for you? You can send a few career-relevant questions too, because there might be some things you’re wondering about your fans, whether it’s places to tour through, or what kind of song they want to hear from you next. You certainly can gather some market data by surveying your audience as well. I think it just really gives you an opportunity to get to know your fans in a fun way. I came up with ten ideas for this episode of the podcast, but there are so many other ways to engage your fans with your emails. You really just have to let your creative juices flow. What do you think of the ideas covered in this episode? Feel free to send me an email to david@dawcast.com. I’ll be more than happy to feature you in an upcoming episode.